In order to fill the entire slate of college football bowl games this season, 15 teams without winning records will participate in the bowl season, but it could be worse. Not including the College Football Playoff championship game, the bowl schedule will include 40 games. Of those, 13 will have at least one team with a 6-6 record, and in two of those games, both teams will be at .500. 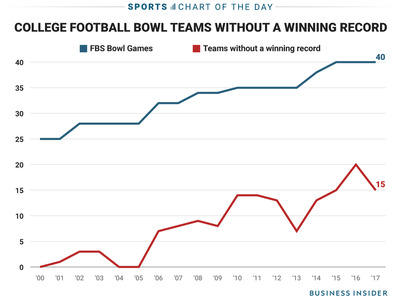 The good news is that the 15 bowl teams without a winning record is actually well down from last year when 20 teams were at .500 or worse, including some teams that entered the bowl season with a losing record. Just 12 years ago (2005) every team in the bowl games had a winning record. However, the number of bowl games has grown nearly 50% since then.